Todmorden Village grew up around a complex of mills and a brewery that operated near the banks of the Don River beginning in 1795. Many of Todmorden’s original families, including the Helliwells and Eastwoods came from Todmorden Village in Yorkshire England. It is this English Village that Todmorden is named after. 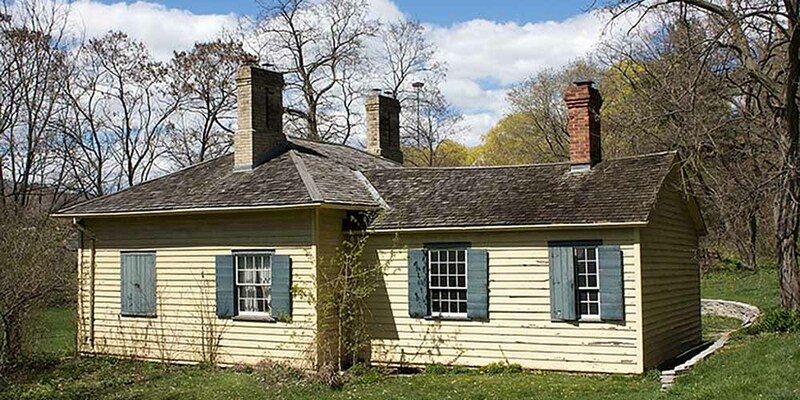 The Todmorden Mills Heritage Museum situated at the foot of Pottery Road and a small number of workers houses east of Broadview Avenue are vivid reminders of this pioneer community. The history of the Todmorden area north of O’Connor is dominated by the Taylor family who came to the Don Valley in 1834. The Taylors owned all of the land north of O’Connor between Broadview and Woodbine Avenues. The Taylors’ business empire in the Don Valley included paper mills, saw mills, grist mills, and the Don Valley Pressed Brick Works which supplied the bricks for many of Toronto’s houses and commercial buildings. The Todmorden Village neighbourhood is a mature, established community with quiet tree-lined streets and solid brick family homes. The rustic beauty of this neighbourhood is shaped by its location perched atop the ancient slopes of the Don Valley ravine. The vast amount of urban forest that shapes the western and northern boundaries of this neighbourhood make Todmorden Village one of the more peaceful and tranquil settings in Toronto. The houses west of Broadview Avenue consist primarily of Tudor and Cottage style brick homes from the 1930’s and 1940’s. Sprinkled into this mix are Victorian cottages and row houses that date from the late 1800’s and early 1900’s. These homes are holdovers from the old Todmorden Village. Many of the houses in this part of the neighbourhood back onto the Don Valley Ravine and enjoy a marvellous view of the city. There are also a handful of lowrise and high-rise apartment buildings situated in this part of the neighbourhood. The six streets north of O’Connor between Pape and Donlands Avenues have been coined “The Golden Triangle” by real estate agents. These charming Tudor style homes were built in the late 1920’s and early 1930’s and include many decorative accents like front porches, leaded glass windows, wood burning fireplaces, beautiful wood trim and hardwood floors. The north-east pocket of Todmorden Village around Four Oaks Park contains some of the prettier stone and brick bungalows in the city. These cosy homes are ideal for singles, couples and empty nesters. The Pape Village shopping district south of O’Connor is brimming with local retailers that cater to the homeowners in the surrounding area. This busy shopping district is very diverse and includes everything from hardware stores and pharmacies to grocery stores, bakeries and restaurants. The retail district located at Broadview Avenue and Pottery Road includes a large grocery store, restaurants, a health centre and professional offices. On a hot summer day it’s worth a stop at the local Dairy Queen at the north-west corner of Broadview and Pottery Road. At the back of this Dairy Queen is an observation platform that provides a spectacular view of the Don River Valley. Todmorden Village residents enjoy convenient access to the Central Don network of parks that follow the valleys of the West Don River and Taylor Creek. These parks are linked together by a nine kilometre paved trail that is ideal for nature walks, picnics, jogging, and cycling. The Todmorden Mills Heritage Museum and Arts Centre is located off Pottery Road. This heritage museum offers year-round programs for the whole family including art classes, a lecture series, a nature program, theatrical plays, and special pioneer festivals. 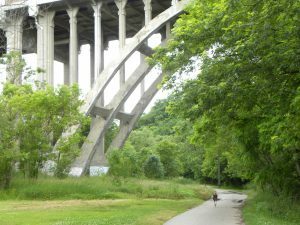 Access to the Lower Don Valley nature trail is located off Pottery Road and at Beechwood Avenue. On your way into this parkland you might want to catch a glimpse of the charming red brick house at number 20-22 Beechwood Avenue. This house was built in 1840 by the Taylor family, and is the oldest privately owned residence in Todmorden Village. The newly renovated East York Community Centre located at 1081 and 1/2 Pape Avenue, offers year-round recreational programs for the whole family. This community centre features a swimming pool, a gymnasium, a weight room and a small public library. Bus services on Broadview Avenue and O’Connor Drive connect passengers to the Broadview station on the Bloor-Danforth subway line, while the Pape Avenue bus connects passengers to the Pape station, also on the Bloor-Danforth subway line. Motorist can drive downtown in five to ten minutes via either the Bloor Viaduct or the Bayview Extension. Commuters are just a few minutes from the Don Valley Parkway, which connects motorists to a series of highways that span the Greater Metropolitan Toronto Region. A small park on O’Connor Avenue east of Don Mills Road that features a children’s playground. Coxwell Ravine Park – 460 O’Connor Dr.
Coxwell Ravine Park is located on the east side of the Don Valley Parkway just north of Don Mills Rd. 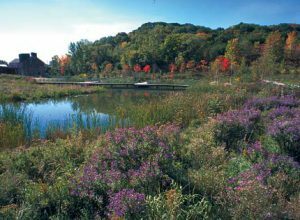 It is part of the extensive East Don Valley Trail system that includes Todmorden Mills Park, Linkwood Lane Park and Charles Sauriol Conservation Area. There is a great picnic area and outstanding opportunities for wildlife viewing. 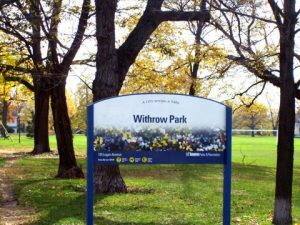 A 1.0 hectare park near Coxwell Avenue and O`Connor Drive featuring a children`s playground. 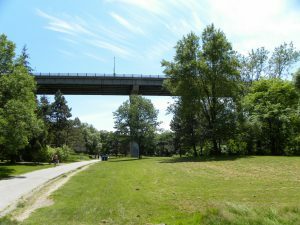 The park is above the Massey and Taylor Creek ravine and is accessible by path from the park down to the Taylor Creek Trail. Taylor Creek Park follows a major tributary to the Forks of the Don River. Three rivers meet at the forks and form the Lower Don River: the East Don, the West Don and this tributary. Known by several names over the years, the two most commonly used names — Taylor and Massey Creek — are taken from two families with important historical ties to the area. A third name, Silver Creek, was used during the early 1800’s. Mature forests, scrub communities and marsh habitat support a diversity of wildlife and regionally rare plants . Directions: Vehicles can enter Taylor Creek Park at Don Mills Road, Haldon Avenue or Dawes Road. Public transit includes the Dawes 23, Cosburn 87, and O’Connor 70 buses. Victoria Park subway station is five minutes walk from the east park entrance. Information provided by the Toronto website. The Don Valley Brick Works, also known as Evergreen Brick Works, is a former quarry and industrial site located in the Don Rivervalley in Toronto, Canada. The Don Valley Brick Works operated for nearly 100 years and provided bricks used to construct many well-known Toronto landmarks, such as Casa Loma, Osgoode Hall, Massey Hall, and the Ontario Legislature. Since the closure of the original factory, the quarry has been converted into a city park which includes a series of naturalized ponds, while the buildings have been restored and opened as an environmentally-focused community and cultural centre by Evergreen, a national charity dedicated to restoring nature in urban environments. 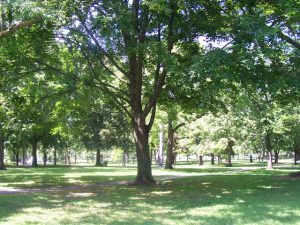 An 8 hectare park on Logan Avenue just south of Danforth Avenue featuring two ball diamonds, a multi-purpose sports field, two outdoor tennis courts, a volleyball court, a dog off leash area, a wading pool and a children’s playground. In the middle of the park is the Withrow Park Outdoor Artificial Ice Rink.